The Walking Dead “After” Recap | Wait! What's A Dial? While out gathering food, he is attacked by a walker and proceeds to use the remaining bullets trying to take him down. Carl loses a shoe in the process, but he does eat an entire 112-ounce can of pudding. Also, that walker is still “alive”. The last time he pulled something like that, Dale died. 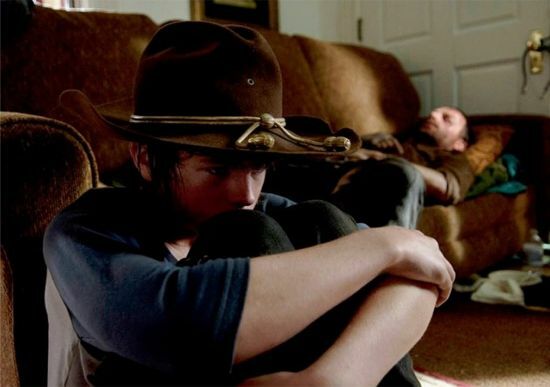 Later that night, when Carl is in the safe house, Rick wakes up. Since he’s in bad shape and Carl didn’t put on any lights, he thinks Rick has turned. Carl points his gun at his father but didn’t have the gall to go through with putting down Rick. Not like he could have if he wanted to, since he used all of the bullets on that one walker. Luckily, Rick is alive and finally says what everyone has been telling Carl from the very beginning: “stay in the damn house”. Meanwhile, Michonne goes back to her old ways and makes herself some walker pets. The biggest thing that happened to Michonne this week was her dream sequence. It is finally confirmed that Michonne had a son before the world fell apart. This is explains why Michonne was crying whilst holding Judith, because she reminded Michonne of her own loss. We see her really struggling with the idea of being lonely again. Michonne had kept everyone at an arms length as a defense mechanism. She had finally started to let people into her life only to find herself alone again. She finds some fresh footprints in the mud. It is at this point where she could follow the footprints, find a companion, and potentially lose them or go another way and remain by herself. She doesn’t follow them. She then changes her mind and decides to follow the footprints. She finds the giant can of pudding outside the house Carl and Rick are in and knocks on the door. I’m really glad they didn’t spend a lot of time on Michonne finding Rick and Carl. Michonne and Carl were friends ever since she got that ugly cat sculpture for Carl, which explains why Rick said that the knock at the door was for Carl. The three are the first ones to be reunited in the comics. Since this season looks like it’s almost identical to the comics, readers will know who the trio will run into next. Hopefully by next week we will find out if the fans are right about Tyreese taking Judith, or if she is indeed dead. It seems like the rest of the season will be dedicated to the group trying to find each other and to find themselves on their way to Alexandria. Posted on February 10, 2014, in AMC, American Television, Cable, Drama, Primetime, Weekly TV Update and tagged amc, Andrew Lincoln, Carl Grimes, Chandler Riggs, Danai Gurira, Michonne, recap, Rick Grimes, the walking dead, Zombies. Bookmark the permalink. Leave a comment.